Al Qaeda released an article in its English newsletter Inspire calling Iran's President Ahmedinijad a conspiracy theorist, and that he should stop blaming the US for 9/11. This is more than just boasting by Al-Qaeda. It's not simply that they want the credit for the attack on the WTC, but specifically, they want to be distanced from the US. Inadvertently, Ahmedinijad is claiming that Al-Qaeda are collaborators with the US, rather than sworn enemies. If the US was involved in a coordinated way, it would undermine Al-Qaeda's anti-US credibility. Even if Ahmedinijad claims the US wasn't coordinating actively with Al-Qaeda, but simply knew about it beforehand and prepped for the attack, it would undermine Al-Qaeda's credibility in effective attacks. If 9/11's mastery was really at the hands of the US, then Al-Qaeda has summarily failed to attack the US on its soil since 1993 (which was ineffectual at best). The split is a sign that different Islamist groups, while anti-American, are far from being able to unite in the cause. It's a sign that US foreign policy--to keep the Middle East broken up and fractured--is working. Libya Mop Up: What's Taking the NTC So Long? 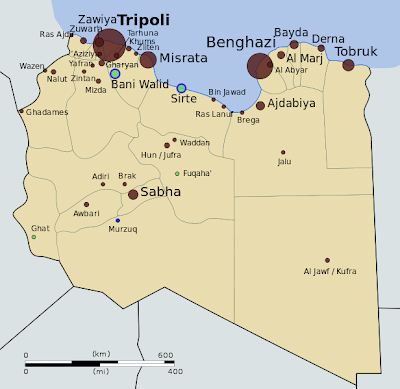 A few readers have asked, "Why is the NTC taking so long to capture Bani Walid and Sirte?" Great question, and (luckily) simple answer. Sun Tzu mentioned that you always want to give an enemy the ability to retreat. If not, they'll fight to the last man, taking many of you with them. In past battles, Gaddafi forces have had the ability to retreat, and chose it, rather than be overwhelmed and destroyed, in the hopes of being able to reorganize and counter-attack. All of Gaddafi's remaining forces are in these two cities, and they have nowhere to retreat to. They will need to be completely destroyed (surrendering counts) in order for the NTC to take these cities, which will be expensive and painful. But ultimately, it is inevitable. The Gaddafi forces in Sirte have no supply lines and will fall to a siege. But, knowing this, they are likely to try to launch a counter-attack against NTC forces rather than be starved out. It's unclear whether NTC forces have significant reserves to deal with a counter-attack. Some rumors fly that they're stretched thin and are low on ammunition, but it's a game they're going to win in the long-term. The problem is that people hate waiting.